Grizedale (15km), Satterthwaite - Cumbrian Trail Guides - Mountain Bike Cumbria - beautiful trails and information from throughout the Lake District and beyond! 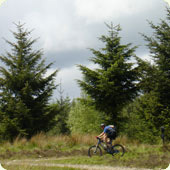 Grizedale Forest mountain bike routes, firetrail fun! Start Point - Blind Lane car park(GR344913) near Force Mills. Turn right (west), towards Force Mills. Then turn right at t-junction (towards Satterthwaite). Then ride to a t-junction with forest road, this is Bogle Crag picnic site. Turn right here, going south at the t-junction, keeping right (on hairpin at valley head, effectively south) then swinging right(again), over spur to t-junction with singletrack bridleway off left (east). I did this route today wasnt very good because it was so wet and there is a massive climb up to low dale park and is difficult to keep going because there are so many rocks. This trail has been viewed 49707 times! You are looking at an article within the geoarea of D9, the links below are related to it.